Approximately 3 years ago, upon our arrival in San Diego, my son Jake bought a young fig tree with visions of tender, purple fruit brimming with a sweet and seedy flesh that evoked visions of Godliness. Not until this summer did the tree produce a bumper crop of this succulent produce. We could hardly keep up. Figs are very perishable and need to be picked at just the right time to enjoy them fully. As summer moved on and cooler fall nights prevailed, we knew we had about the last eight figs on our tree. My son and I decided to bake a fig crostata. On the morning of our baking project, Jake went to the back yard to pick our last figs of the season. Upon returning to the house, with an ashen face, he squeaked out “they are all gone.” I ran out to the tree and lo and behold a devious creature, perhaps a raccoon or squirrel, had robbed us of our figs. One sat sadly in the dirt half eaten with a few ants devouring their sweet treat. On close inspection, I found a couple that were not quite ripe and remembered I had been fortunate enough to pick one a couple of days prior and store it in the refrigerator. Now here comes the happy ending: without enough figs (it didn’t seem right buying them at the grocery store) I needed to add a second fruit to round out our crostata. I selected plums knowing that they hold up well in tarts and crostadas. 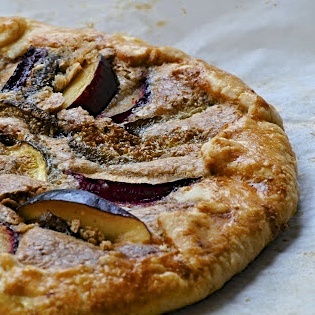 They were perfect partners - a fig and plum crostata. The fig was delightfully sweet, and the plum slightly tart. The hazelnut filling added another layer of satisfying nutty sweetness to complete this perfect dessert. I really do prefer happy endings! 2. For dough - combine flour, sugar, and salt. Add pieces of butter and using a pastry cutter or fork, cut in butter until mixture resembles coarse meal. Slowly pour in ice water and work into mixture until it forms a dough. Roll dough into ball and slightly flatten into a disk. Wrap in plastic and put in the refrigerator for at least an hour. 3. Make filling - in a food processor combine hazelnuts and sugar. Mix until finely ground. Add 1 egg, butter flour, vanilla and salt - pulse until smooth. Set aside. 4. Slice figs and plum vertically into 1/4 inch wedges. 5. On a large lightly floured piece of parchment paper, roll dough out into a 12" round. Spread hazelnut mixture over the top, leaving a 2 inch border. Lay down figs and plums in overlapping, concentric circles. 6. Fold border over edge of filling, pleating as you go. Take last egg and mix with 1 teaspoon of water, brush dough with egg wash.
7. Lifting edges of parchment, transfer to a rimmed baking sheet. Bake until crust is golden brown, about 1 hour. Let cool for at least 30 minutes. Serve with whipped cream. Thanks Mal. It's surprisingly easy to make as well!